It’s official, it’s spring time in the United States! For you warmer climate states, that probably doesn’t mean a whole lot to you, but to us Northerners, it means a great deal. It’s the first time we can see our yards, granted they are littered with winter debris, and the color of brown grass is not appealing, but we will take what we can get! 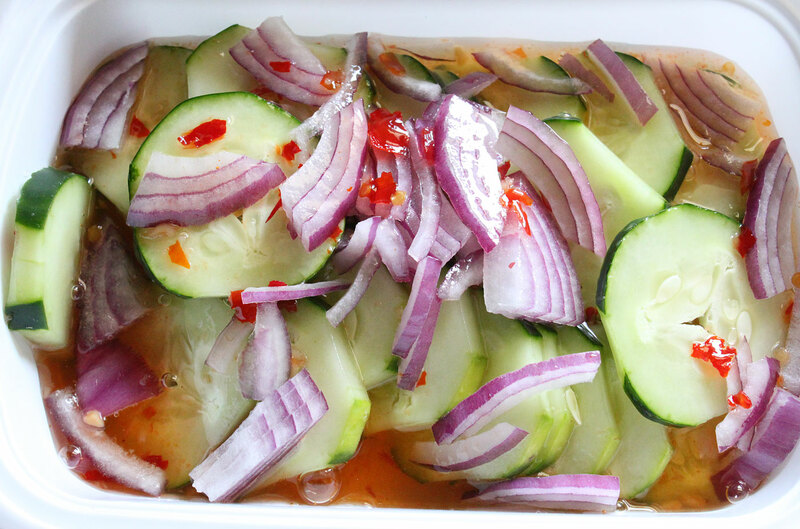 With spring time said, it is that time where the chili dishes take a step to the side, and where other brighter dishes take a step forward, for example, this dish, the Thai cucumber salad. I’ve made this recipe numerous times and I’m surprised I have never posted on the matter, as after all this salad is bright, diverse, easy to make, and super delicious. Need I say more? 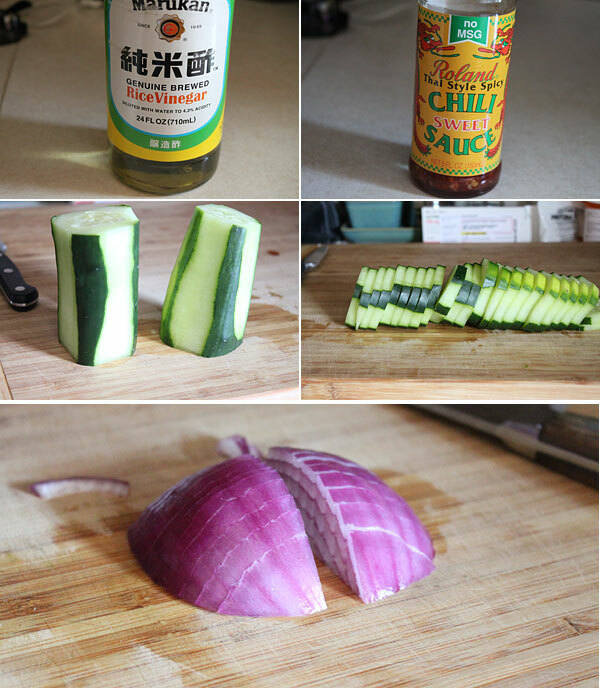 Start by adding the sugar, salt, rice wine vinegar, and water to a sauce pan. Bring to a simmer, and cook until the sugar dissolves, about 5 minutes or so. Remove from the heat, add the chili sauce, and let cool. Once cooled, add the cucumbers and red onion to a serving bowl. Pour the sauce over the vegetables, and gently stir. Let this sit for about 30 minutes, or overnight. When you are ready to serve, feel free to sprinkle with roasted peanuts and fresh herbs such as mint, or cilantro, however without these, this salad stands tall. The great thing about this salad is that you can serve it with practically anything. It is really perfect as an accompaniment to pretty much everything. It’s flavors are sweet with just that subtle amount of heat from the chili sauce. You can use the cucumbers and onions on sandwiches, as a side to grilled meats for vegetables, on omelets, or what I did, and serve with a side of seared tuna. However you decide to serve it, I’m certain you are going to love this recipe. Hope you enjoy! We really enjoyed this a lot with your Isan Grilled Chicken and some jasmine rice. I have some leftover sauce so am about to add more cucumber and onion to it to have tomorrow instead of wasting such a delicious thing. Might have it with some grilled pork or fish I think. Thank you.